By all accounts it was a wonderful 90th birthday celebration for Doris full of celebratory activities and surprises! Tremendous thanks should be given to the great people at the Doris Day Animal Foundation who were gracious hosts during the three day affair. They far exceeded their goal of raising $90,000! I'm sure Doris is very proud of her organization for all the months of hard work they have put in to bring this glorious celebration to fruition. On Thursday April 3rd Doris made an appearance on her balcony to wave and chat with some fans via cellphone. Doris looked resplendent in her white coat with a shimmering pink top. Laura Didier and Jim Martinez provided the live entertainment at the Cypress Inn that night. They were fantastic entertaining Doris fans from many parts of the world. Friday, April 4th was the official birthday celebration dinner at the Quail Lodge in Carmel. Peter Marshall emceed the event. Laura Didier and Jim Martinez again entertained the crowd. A silent auction was held with actress Jackie Joseph taking over the mike. We are told Jackie did a great job! The best surprise of the night was the appearance of the birthday girl, Doris. She wowed the crowd and gave fans the absolute thrill of a lifetime! She greeted each person individually, giving him/her her undivided attention and also allowing photographs and videos taken with her. The crowd sang Happy Birthday and all joined in including Doris for a rousing rendition of "Que Sera, Sera". Doris stayed for the entire event thoroughly enjoying herself as did all who were present. Saturday, April 5th the DDAF hosted a pet fashion show at the Cypress Inn. The master of ceremonies for this event was Jackie Joseph. The models were animals who were in need of a home. Many of those animals found new forever homes that day! Again we want to to give a big shout out to the Doris Day Animal Foundation for giving Doris Day fans such a warm welcome and a thrilling weekend! Below are some photos and videos from the event. 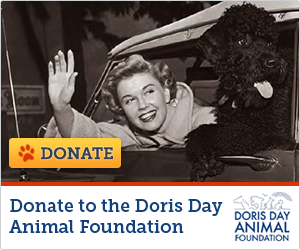 If you can please donate today to the Doris Day Animal Foundation! 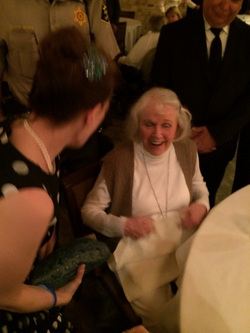 Doris Day Turns 90! A Fan's View of Meeting Her Idol! "You can only imagine how elated everyone was when Doris walked into her own birthday party! I nearly fell off my chair! Really! Jim said that all of us fans looked like the screaming fans at a Beatles concert. When I say fans, I am talking men and women, so you can imagine the display!..." Thanks so much to all of you at the DDAF!